One of my favorite things about this time of year is all day cooking! 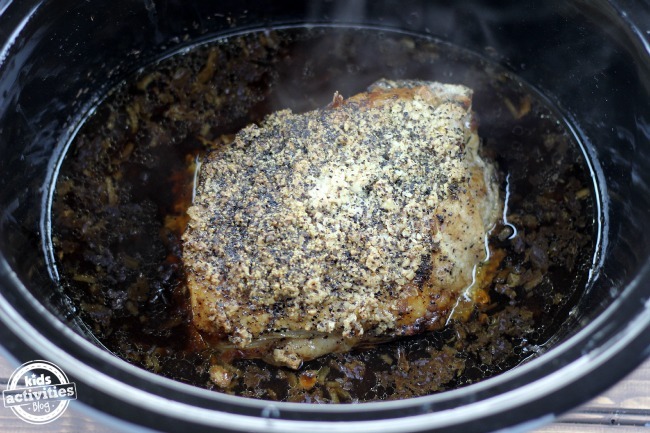 We love to slow cook chili, stew, soup and roasts in our slow cooker. 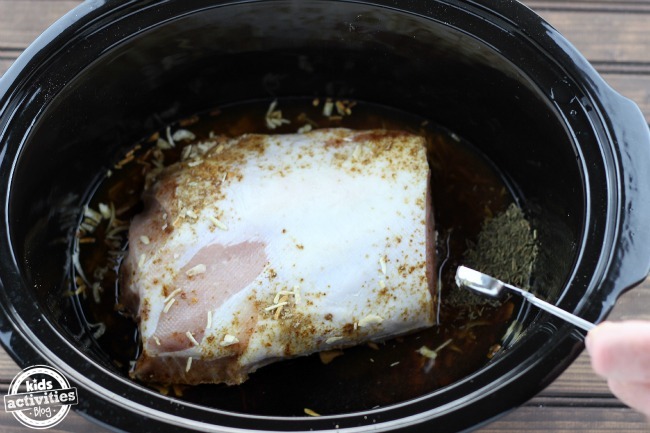 We just started experimenting with this Slow Cooker Pork Loin recipe. It cooks for about 4 hours and makes the perfect “star” to any main dish. 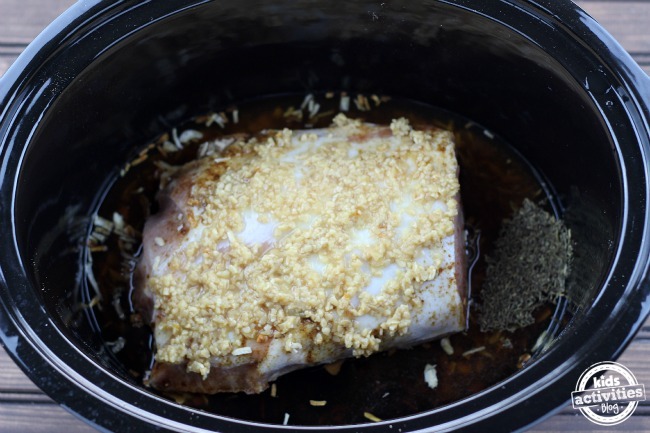 If you’re not home during the day to watch over your meal, the set it and forget it slow cooker (affiliate) will turn the heat down for you once your food is cooked! So handy! 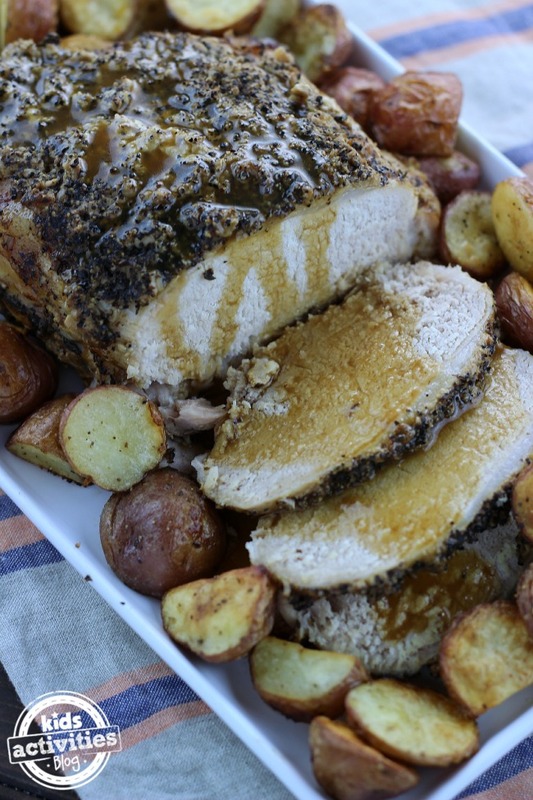 This meal also makes the perfect alternative to a traditional holiday dinner. Especially when you add potatoes and a veggie! Cook on low for 3-4 hours. The meat is done when it reaches 160 degrees. 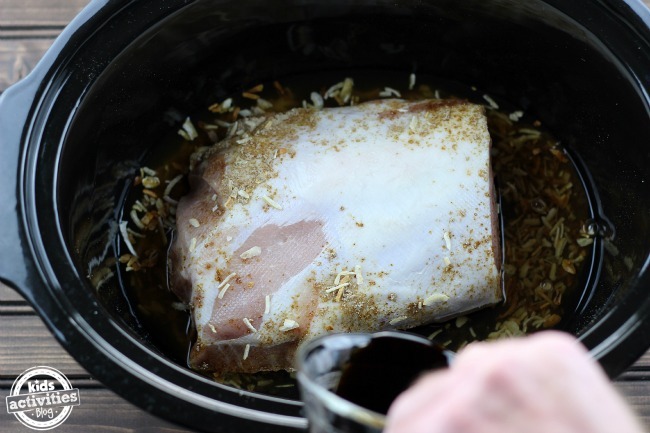 Make sure you add your pork loin fat side up. This will guarantee you absorb the best flavors with the rest of the ingredients. Add a packet of Onion Soup Mix on top. Add a cup of water. Add your low-sodium Soy Sauce. You will have plenty of salt from the Onion Soup Mix. Add the thyme and juice of 1/2 lemon. 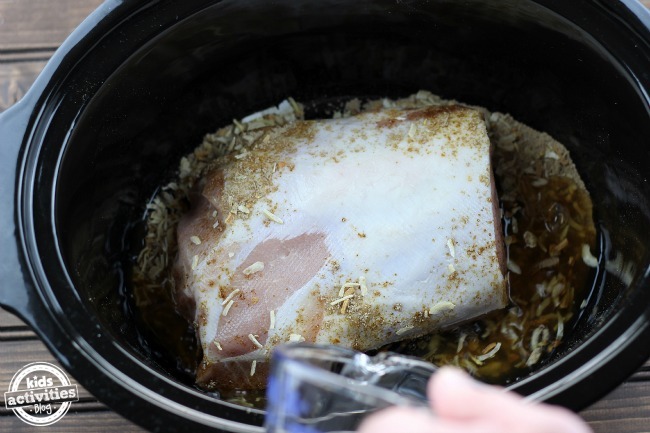 Spread the minced garlic on top of the pork loin. Then add pepper on top. Cover the pan and cook on low for 3-4 hours. 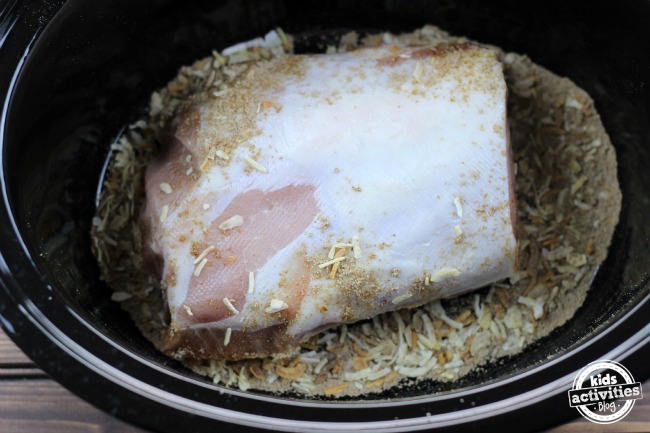 Using a meat thermometer, test the meat after 3 hours. It will be done at 160 degrees. 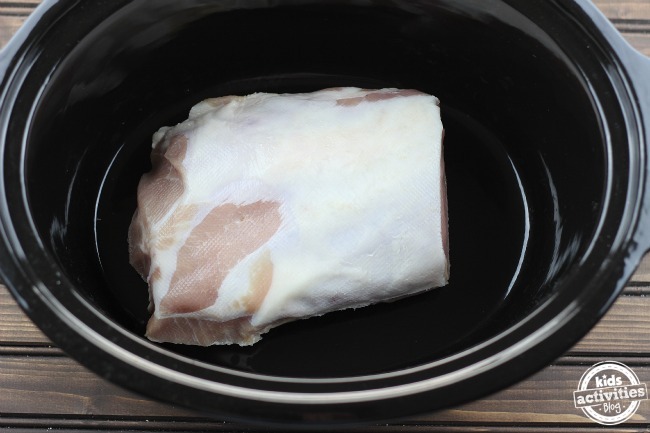 Your meat will look like this when it’s ready. 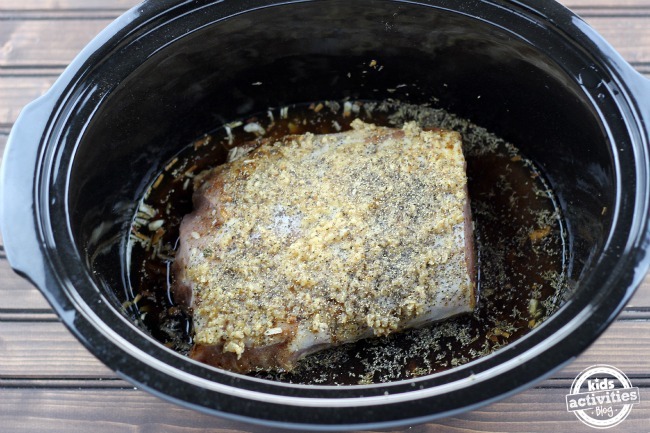 Take out the pork loin and use the juice at the bottom of the pan for sauce. Just strain the juice left in the cooker. In a saucepan, reduce the juice down to thicken it. Add a mixture of flour and water to thicken up the sauce. Add your favorite sides and you have a complete, yummy meal!